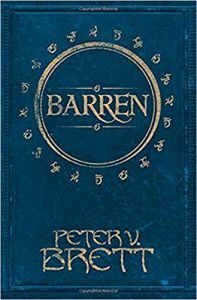 You are here: Home » MEDIA » Books » Barren (A Demon Cycle Novella) by Peter V Brett (book review). Peter V Brett’s ‘Demon Cycle’ is an epic fantasy set over five fairly sizeable books and a number of accompanying novellas. ‘Barren’ is the most recent of those novellas and with only 135 pages you might expect it to be a little light on content but, in those pages, Brett fits in what many others would take 300 pages to say. ‘Barren’ focuses primarily on the life of Selia Barren, a matriarchal figure in the small town of Tibbet’s Brook. Given the moniker of ‘Barren’ due to her lack of children, Selia has always treated the people of Tibbet’s Brook like her extended family and she protects them with a ferocity and stubbornness that has earned her a few enemies over the years. Now acting as the Speaker for the town, a new influx of demons and trouble with neighbouring villages has some folk calling for her to be replaced. While some simply fear for their safety with an old woman in charge, others are holding grudges from decades before. Trouble is, mind demons can get into your head and use those fears and that anger, so if Selia can’t find a way to unite her town, everyone might be lost. I always love getting my hands on a new book by Peter V Brett because he delivers great characters, incredible action and top quality stories. Right from the start of ‘Barren’, the characters leap out of the pages and the reader is involved in their lives. We experience the minutiae of the mundane day to day things and the exhilaration of the extraordinary: love, fighting and living life to the full. Selia herself is a wonderful figure and it’s nice to explore this world’s attitudes to homosexuality through the decades, looking at Selia’s life in the past and moving through to the present. Of course, this exploration of Selia’s life is not the only thing going on in the book and Brett skilfully layers her backstory in with the present day events, namely the upcoming election and the ever-present demon threat. The mind demon battles are filled with action, delivering a physical and psychological frenzy of attacks that will leave you on the edge of your seat. They’re interspersed with the more reflective moments and bolstered with a backbone of political machinations and some good old human cruelty. There really is a bit of something for everyone, even though it’s such a short book. ‘Barren’ is a satisfying little book, perfect for when you need a punchy story to give you a break between bigger tomes or successive instalments in that series you’re currently reading. It’s a must for fans of the ‘Demon Cycle’. « Shazam! (2019) [a film review by Frank Ochieng].